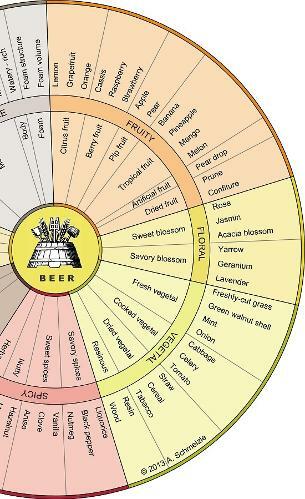 The beer aroma wheel is a useful tool to describe the complexity of beer. Whether you are a beginner or a beer connoisseur, the use of the wheel during beer tasting will facilitate the description of the sensory perceptions. Using comprehensible attributes familiar from daily life allows beer connoisseurs as well as beginners to communicate among and with each other in the same language. Use it next time you taste a beer and you’ll be surprised how well this list of descriptive terms helps you to make out some characteristics.